UCCS hosted an Ethics First event on Sept. 11. The keynote speaker at the event was Stephen M. R. Covey, a speaker on the subject of leadership and ethics, who wrote the book “The Speed of Trust,” which is available at the UCCS bookstore. “The Speed of Trust” talks about trust as a key aspect of any business, team or educational institution. “Trust is the currency of our time,” said Covey during his keynote speech at the Ethics First event. Covey said that when the trust between members of an organization goes up, the faster things get done within that organization. “Nothing is faster than the speed of trust,” said Covey. According to Dr. Tracy Gonzalez-Padron, director of the Daniels Fund Ethics Initiative at UCCS, as well as a professor of marketing and business on campus, building trust is one of the main goals of hosting the Ethics First event at UCCS. “I’m hoping that people took from the Stephen Covey presentation what they can do to improve and to build trust or to talk about trust,” said Gonzalez-Padron. Much of this is done in an attempt to give students practice with being able to make ethical decisions in their own lives. “If you practice this, then when you have an ethical situation, you’re not like ‘What do I do?’” said Gonzalez-Padron. The Daniels Fund Ethics Initiative has been around since the beginning of 2010 and not only sponsors UCCS’ ethics program, but also the ethics programs of nine other schools in Southern Colorado. When the program was first starting to come about in 2008, UCCS was one of the eight schools invited to be a part of the initial pilot program. 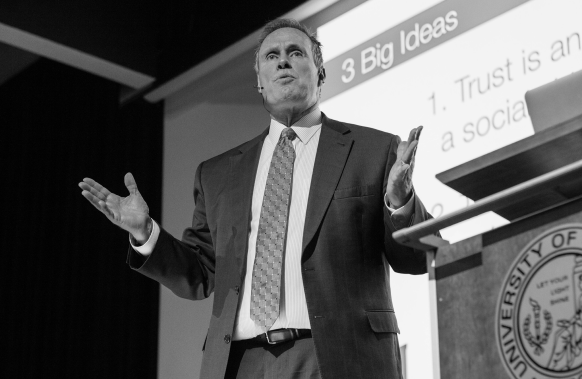 Since then, UCCS has begun to grow the ethics program, and Covey’s presentation was the second event of the Ethics First program. For more resources about ethics at UCCS, visit the Daniels Fund Ethics Initiative at UCCS page at https://www.uccs.edu/business/resources/ethics.